I'm currently working on a novel and driving my partner mad. I write because I need to create. In the past I've painted water colours and made pots, but writing is the most comfortable way of indulging my imagination. George Eliot, Thomas Hardy, Gustave Flaubert, Elizabeth Bowen, Virginia Woolf, Guy de Maupassant, Raymond Carver, Daphne Du Maurier, Rose Tremain, Tracy Chevalier. Thanks for the fave of "Eleutheria"! Thank you, Deborah, for your comment on "Eleutheria." I appreciate it very much. 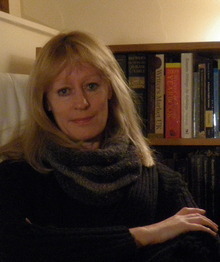 Hi Deborah, Thanks very much for taking the time to read "Portrait of the Poet as Midwife'. I appreciate your generous praise. Thank you, Deborah, for your kind comment on "The sky on that day." Thanks for your comment on "New Song of Innocence and Experience." Welcome to Fictionaut, Deborah. Thank you for commenting on "She Waited for Him." Many thanks for your comments on "Sleep Music, No. 1." I'm glad you enjoyed it so much. I think perhaps it's too adventurous for many of the readers at fictionaut, but I'm glad a few people get it. I look forward to reading your work. Thanks for the nice words on my story "Vanya." Thank you all for your comments and wonderful welcome. I've read some great stuff here and had interesting discussions already. I feel my experience has already broadened considerably. Thanks for your generous and insightful comments about 'Tomorrow,' Deborah. And welcome here. I too have painted, but find nothing so satisfying as arranging words. Welcome to Fictionaut, deborah, and thank you for the detailed and generous comment on "fox". I appreciate your close reading. I did not mention the lack of tools in the beginning because in flash it is so easy to get distracted and the tools don't really play the same role as a Chekhovian gun, say. Still, I can see where you're coming from! You came to the right place. Welcome aboard! Thank you for reading and commenting on Escape Literature. I appreciate your thoughtful comment. thanks for the kind words. yes, there are some very supportive and creative souls on here. welcome. look forward to reading more of your writing. very much liked a black night. great writing. You must log in to write on Deborah Rickard's wall.